Released: November 2006 (Europe). Genre: RPG. Other versions: XBOX; PS3; PC; WII; PSP; GBA. One of the more cherished series of the sixth generation was X-Men: Legends. Featuring rock solid action-RPG gameplay and terrific storytelling, both gamers and fans of the comics enjoyed the two instalments in the series. Building off the extremely solid foundations, Raven Software would take a crack at the entire Marvel universe with Ultimate Alliance. It almost serves as a dictionary of Marvel heroes and villains, ranging from Spider-Man and Dr. Doom to Moon Knight and Ultron. But does the mix of smashing and role-playing remain fun? MUA opens with the S.H.E.I.L.D. helicarrier under attack, though it is rescued after the distress called is answered by four heroes. This opening level serves to introduce you to the gameplay mechanics, while also beginning an evil plot revolving around a group of super-villains who unite together to thwart the heroes. Naturally, Nick Fury calls all the heroes together in order to stop this threat. From there, the quest spans multiple realms of the comics, and features plenty of twists, turns and explosive events to keep you engaged. The dialogue, at times, can feel a bit juvenile for the serious nature of the villain’s plot, but any comic fan should be completely hooked. 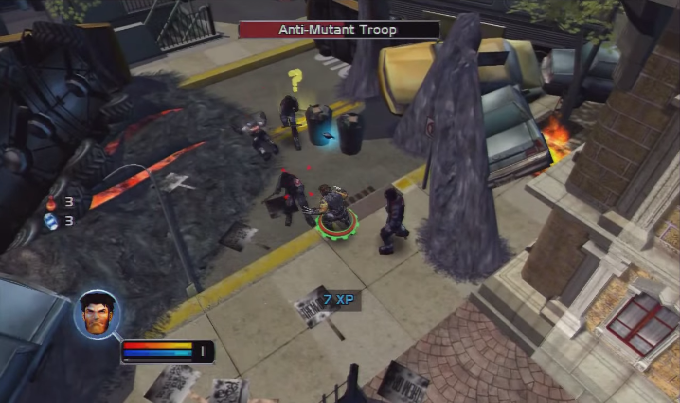 Much like the X-Men: Legends games, Ultimate Alliance is a blend of action and RPG. Each level tasks you with taking up to four superheroes through lengthy missions, clobbering anything in your way while earning experience points. Some branching paths present themselves, but usually levels are pretty straightforward. 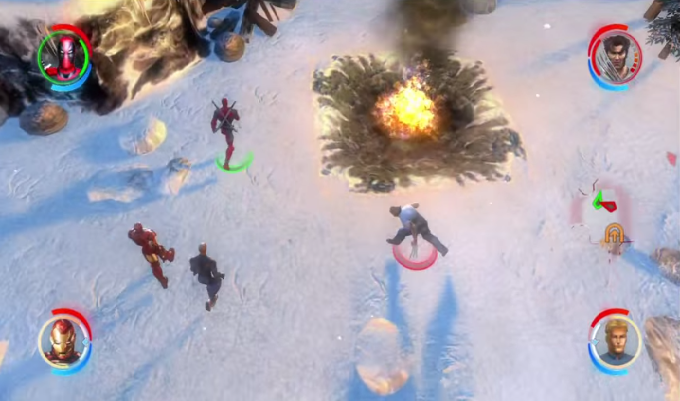 Heroes start with two basic attacks and a grapple move, as well as a few abilities. As you increase their level, they begin to earn more abilities and skill points to upgrade these. There is also the element of looting, as items dropped can give benefits to your heroes, particularly ones crafted for specific heroes. S.H.I.E.L.D. points allow you to save, change your team and extract to different areas, meaning you can take a break during the lengthy levels. While combat may seem pretty simplistic, a lot of depth is instilled through choosing your heroes. It’s not merely a case of choosing your favourites, as benefits are instilled through creating actual teams based from the comics. For example, picking any of the members of the old-school Avengers will grant you 15% extra energy. Plenty of preset groups are available, but you can also construct your own teams, which as you use, will become stronger through levelling up and earning reputation points. There’s definitely a lot of freedom to experiment, though it’s also positive that much of these systems can be skipped if you desire. You can certainly make good progress on Normal difficulty without even considering these elements, though Hard is a fair bit more punishing. It all just adds some optional extra wrinkles to the combat. MUA earns a lot of brownie points for the sheer amount of Marvel characters you encounter. The 20+ group of heroes you can use run the gambit from popular guys like Spider-Man and Iron Man to lesser heroes like Moon Knight, Luke Cage and Spider-Woman. 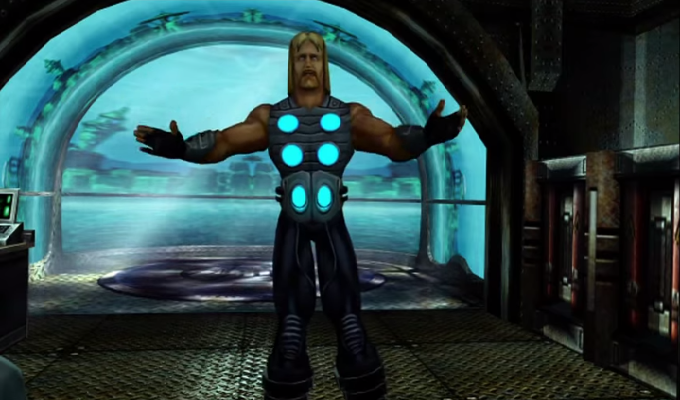 Every character has their own strengths and weaknesses, such as Thor’s increased elemental power, while remaining mostly balanced to use. Each character even comes with four costumes, and these even include extra stat boosters, meaning they are not merely cosmetic. Unlockable characters are also available, such as Daredevil and Black Panther. But the Marvel power extends beyond the playable characters. The amount of villains you’ll do battle with is awesome, keeping fights fresh, and even NPCs are interesting to talk to. Conversing with the likes of Hank Pym will give you extra knowledge on the Marvel Universe or tap into your inner geek. MUA’s quest is lengthy, and there’s plenty of reason to stick around. You’ll be finished with the story missions in about 15 hours or so, should you go down the straight path. Side missions are aplenty, some of which alter the malleable ending sequence. Though it’s interesting to watch, it’s not really worthwhile playing through the whole game again to witness it. Playing on Normal allows you to carry your stats over to Hard difficulty, enticing a second playthrough. And god knows you need it, as Hard can be pretty brutal should you attempt it from the get-go. Collectibles are plentiful, including artwork, skill points and extra missions. Comic missions are worth getting, as they give bigger rewards depending on how many points you earn, unlock more costumes and give back-story to both heroes and villains they are based on. Another key – and successful – element of MUA is co-op. The entire game can be played solo or with three others, either on the same console or through Xbox Live. When playing alone, you’ll be accompanied by three A.I. companions and can switch between your team members using the D-Pad. The A.I. does a good job of keeping up, though they can be unresponsive when attempting to give them commands. Co-op is terrific though, adding more tactical planning when it comes to co-ordinating moves. Performing abilities with two heroes at the same time often increases damage, and it’s easier to co-ordinate attacks. There’s also the added Arcade mode, which can be turned on during gameplay and will tally your score between each other, adding competition too. 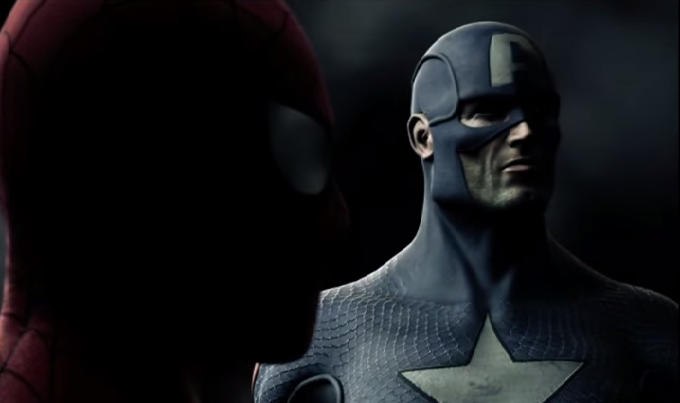 Marvel: Ultimate Alliance shifts away from the cel-shaded style of the Legends games, opting for a more realistic look, and the results are mixed to a degree. Positively, environments are detailed and varied, as you travel from an oriental lair of the Mandarin to the entirely underwater city of Atlantis, as well as plenty more Marvel locales. The characters, unfortunately, lack detail. 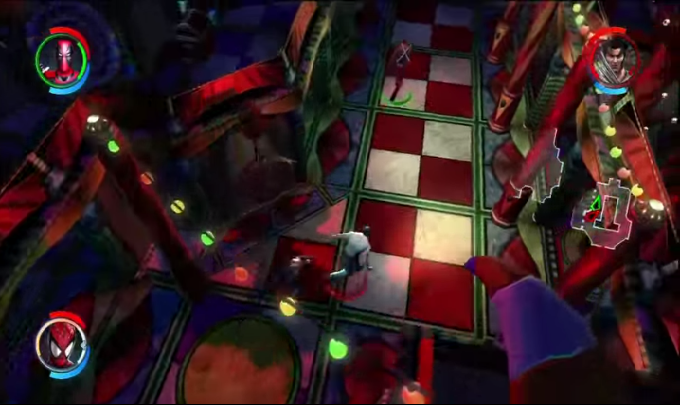 They often feature stretched texturing, and lack any facial animation during in-engine cutscenes. Some beautiful CG cut-scenes are mixed with dodgy, blurry engine-built ones. The audio is a lot more successful, featuring terrific music which fits with the source material and keeps the action hot. The dialogue and voice work can be a tad corny, but it fits too. The only other downer is some odd sound glitches during certain bosses, causing music to cut out entirely, but otherwise, it is good on the ears. Marvel: Ultimate Alliance serves up another great entry into Raven’s dungeon-crawler series, taking the good parts of X-Men: Legends and expanding it to the entire roster of the Marvel Universe. Though its gameplay may seem pretty simple, the RPG elements and perks from choosing your team make things way more interesting. Smartly, Raven allows you to explore these elements as much as you please, which is especially useful when playing with four others on the couch. 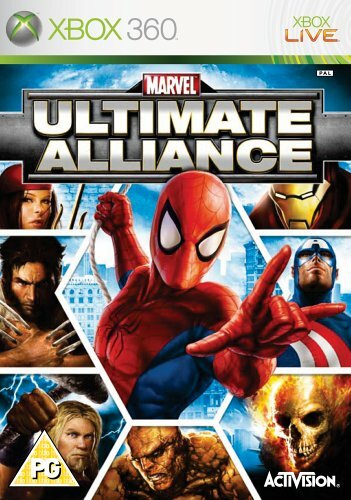 Whether you’re looking for a fun dungeon crawler, a riotous co-op experience or something to satisfy your inner Marvel nerd, Ultimate Alliance ticks the right boxes.